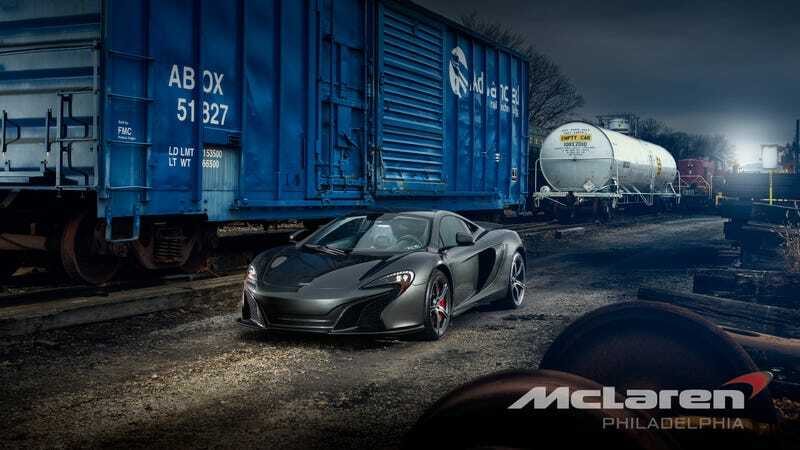 Welcome to Weekend Wallpaper, this time we have for your perusal a McLaren 650S coupe. Right now, this car is sitting on display in some kind of teal blue vinyl wrap (sell this thing to deadmau5? McLarnyan? ), but I much prefer its original "Storm Gray" as captured by reader Evan Wawrzyniak. If you're impressed by the shot, and I think you should be, Evan apparently is employed to go around taking awesome photographs like this by his employer and the owner of the vehicle, McLaren Philadelphia. So don't complain too much about the watermark, in fact, I think it makes it look a heck of a lot more "official wallpaper"-ish that way. I could bore you (excite you?!) with all the details of this lovely car, but Evan actually sent us a cheat sheet on this very 650S, so please read through it and drool over it. English heart, but its muscle is put into practice by an Italian connection. Photo credit to Evan Wawrzyniak/McLaren Philadelphia. Used with permission. Normally, a link to the full-size version would be here, but in this case, please expand the original.